Defense Secretary Ash Carter pledged Friday the U.S. would "remain committed" to Afghanistan for upcoming years as Donald Trump prepares to succeed President Obama as commander in chief. Carter, who arrived in Kabul on an unannounced visit, appeared alongside Afghani President Ashraf Ghani to stress the importance of maintaining a U.S. presence in the country, particularly amid a renewed Taliban insurgency. "The interests we are pursuing here are clear and enduring," he said, alluding to the aims of preventing another 9/11-style attack in the U.S. and helping to stabilize Afghanistan, the Associated Press reported. "To have a stable security partner that is eager and willing to work with the United States is an asset for the future for us," he continued. 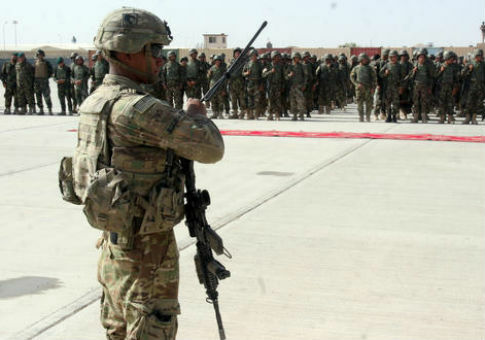 Nearly 10,000 U.S. troops still remain in Afghanistan to train and advise Afghan security forces more than 15 years after the U.S. first invaded the country to topple the Taliban. The U.S. now estimates that the Afghan government controls less than two-third's of its population while the Taliban holds authority over some 10 percent. Carter's surprise visit marked his final trip to the country as defense secretary under President Obama. President-elect Donald Trump has not yet outlined whether he will pull back American involvement in Afghanistan, but has previously denounced U.S. "nation-building" efforts. Trump nominated retired Marine Corps Gen. James Mattis to succeed Carter as head of the Defense Department. Mattis, who must acquire a waiver from Congress to move into the position, led the first large U.S. ground force into Afghanistan in 2001. Obama had planned to draw down U.S. troops in the country to about 1,000 by the time his term ended next month, but that goal was derailed amid Taliban gains. This entry was posted in National Security and tagged Afghanistan, Ash Carter, Barack Obama. Bookmark the permalink.